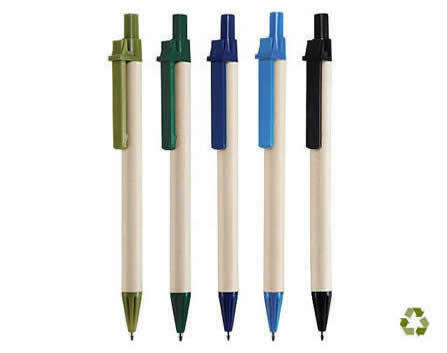 Eco Pen Suppliers South Africa- A great promotional item, an eco-friendly pen is perfect for an everyday staff item. Made from natural materials, this is a wonderful way to show off your “green” business culture. A clever way to give out a unique branded item, eco-friendly items are very popular at the moment. Giving out a useful everyday item while promoting your socially aware brand, this is an ideal marketing tool. 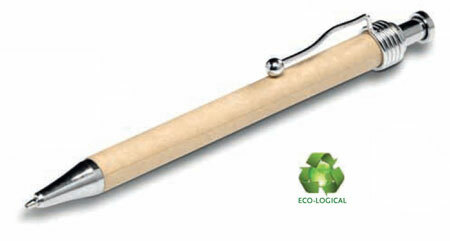 Made from recycled wood pulp, this is a smooth pen option that is good looking as well as eco-friendly. On par with today’s business culture, everyone wants to b apart of an eco-friendly brand. With a beautifully designed stainless steel clip and tip, this is a great looking branded pen option to use daily. A common item in day to day business, pens are the most efficient way to promote your brand. Whether giving them out as promotional items or to staff members, these are excellent at showing off your brand. For a quote from premium eco pen suppliers in South Africa, e-mail info@brandinnovation.co.za now. Eco Friendly Conference Set South Africa- A wonderful eco-friendly conference set that is perfect for spreading a positive brand message to clients and customers, the Eco-Logical A5 Conference Set is a small pen and pad that is perfect for taking notes over a conference. A great way to give out cost effective branded items to conference goers, these are sure to come in handy time and time again. A great, cost-effective conference gift that can be customised to suit your brand image, this not only sends a positive message about your brand, but also makes for an entirely handy pocket item for your conference bag. A wonderful way of connecting with clients in a meaningful way, a clever branded conference gift can make all the difference in your future business dealings. Don’t miss out on the stunning Eco Friendly Conference Set, e-mail info@brandinnovation.co.za now to order yours. 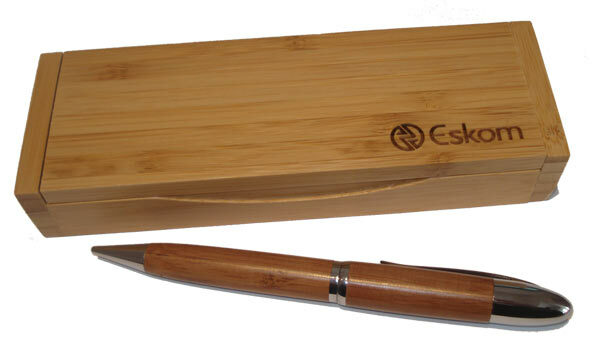 Bamboo Pens South Africa- A wonderful, eco-friendly way to gift special clients and staff members, a printed or engraved bamboo pen is a sleek and stylish office item that is perfect for promoting your functional brand image. A great way to show off a “go-green” business model, this is a functional every day selection on items that clients and staff members are sure to fall in love with. A great selection of eco-friendly gifts for clients and staff member, these gift pens are fantastic to use and offer an everyday marketing tool for your modern brand. 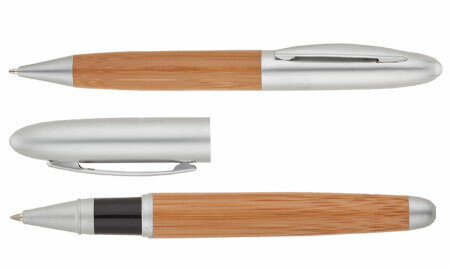 Don’t miss out on these stunning bamboo pens, a truly wonderful eco-gift idea. E-mail info@brandinnovation.co.za now to order yours. 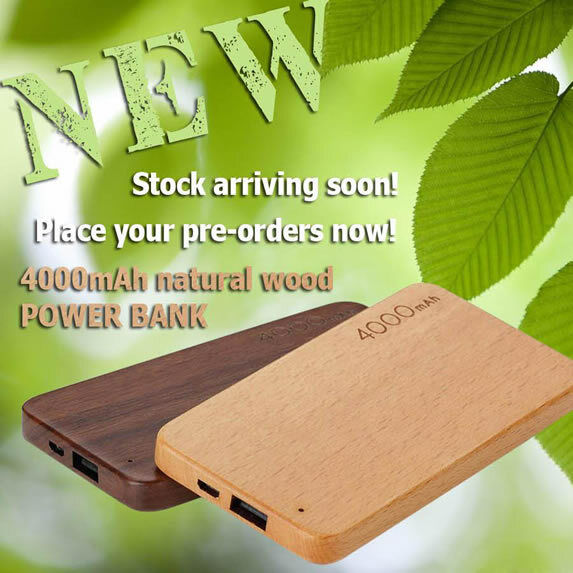 Wooden Power Bank South Africa- An awesome new technology gift to hit South Africa, the Wooden Power Bank is an eco-friendly power bank option with a natural wooden case. Perfect for a holiday or business trip, this awesome gadget ensures you will never lose power to your mobile devices in times of need. A great branded gift for executive clients and staff members, this awesome power bank can have your brand name or logo either printed on it or stylishly engraved on the front face for that sophisticated look. Brilliant for executive clients, great to have around the office or at home, this device is strong enough to power smart phones and small cameras with ease. With a handy 3-in-1 charging cable to fit any device and a super smooth finish, this is perfect for making an impression on important people in your business. Don’t miss out on this awesome Wooden Power Bank, e-mail info@brandinnovation.co.za now to order yours. The Journey of Going Solar South Africa- The journey of going solar is always an interesting one, from learning this new technology to integrating it into modern business, this new age of electricity is a world of discovery. As a leader in South African marketing and branding, Brand Innovation is always looking to new horizons to better business around the country. With a sustainable goal in mind, we have implemented the first step in our “going-green” initiative. An eco-friendly approach to business is fast becoming to norm in the corporate world, companies opting to rather go off the grid to build a sustainable and reliable power source for their corporate needs. With the current power crisis in South Africa, as well as the ever-evident impact of fossil fuels and traditional power alternatives on the world, this is a very important and needed move as to lessen our impact on the environment. There many benefits to going green, especially for a business. Firstly, it’s free…in a sense. Solar energy can be harvested from the sun, whether for water heating or electronics, once the panels and boxes are up there is only the cost of upkeep to worry about- none of your money goes towards the purchasing of electricity from the grid. Solar energy is also clean- with almost no negative impact on the global climate, solar energy does not have harmful by-products like its fossil fuel counter parts, which emit huge amounts of carbon dioxide and other harmful greenhouse gasses. Solar energy is also renewable. Unlike fuels like gas and oil which are becoming increasingly sparse, solar energy is limitless in every mortal sense- seeing as the sun is a few hundred thousand years from dying- wherever the sun is shining, there is electricity to be collected. Not to mention that in many countries around the globe, people can reduce taxes and fines by moving towards solar energy, making it the better option for the environment as well as your wallet. A great initiative that we have been excited to get behind, Brand Innovation has undertaken a journey of self-sustainability. With the current upgrade of our solar system taking us to 60% off the grid coverage, meaning all of our computers, lights and water are covered by this system, this is a wonderful step towards an efficient and eco-friendly business climate in South Africa. A way to not only save on the cost of fossil-fuelled energy, but to also maintain the smallest possible carbon footprint, this allows us as a corporate entity to move away from the grid and become self-reliant. A way to empower businesses in more than just the literal sense, going for the “greener” power option is profitable for your company as well as the global environment. This is the time to take responsibility and do our part to protect our planet. Whether educating the world or upgrading your business structure, taking the initiative and reducing our collective carbon foot print is the perfect way to ensure safe, “green” and productive business practices. “Eco friendly” means to find a way to wipe out waste. Help reduce the impact we as humans have on the environment by using eco, biodegradable shopping bags. Avoid the normal, plastic bags as they take years to degrade and therefore dangerous to our eco systems. Opt for an eco-friendly shopping bag. You don’t know what to look for? That’s why Brand Innovation is here. 1. Choose a shopper that is made up of a durable, reusable material. Reuse is super important, because the less materials we use the more we conserve for the future. Look for materials like hessian/jute, hemp or bamboo. 2. Check if the eco shopping bag is washable. When using a bag over and over again, we naturally want it clean. If it is machine/hand washable it can be cleaned easily and used without a sweat. 3. Always having a problem with plastic bags breaking under the weight of groceries? Don’t worry about it! An eco-friendly bag of the same size, can take more groceries and not even strain. So any normal size will immediately give you more space and stability while shopping AND reducing your carbon footprint. Brand Innovation is a proud supporter of the eco-friendly movement as well as a premier supplier of GREEN products throughout South Africa. Branding is available. Please contact us at info@brandinnovation.co.za for more information and let us help you give a lovely, useful GREEN item as a promotional gift. We also provide other eco bags and biodegradable shopping bags at Brand Innovation. As well as a variety of other products that minimize the harm done to our precious Earth. Do you need a promotional item to give to clients and / or staff? Then we can assist you with our great Bamboo notebook and pen. At Brand Innovation we offer a wide range of beautifully designed eco-friendly notebooks. Our notebooks are useful and gloriously green. 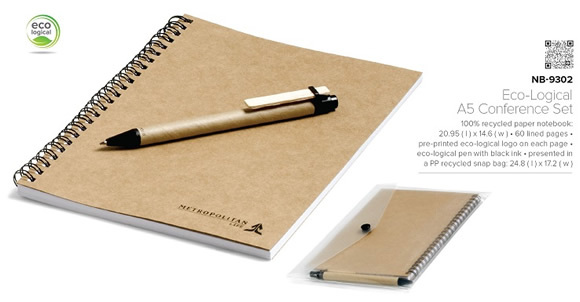 Take the green initiative even further by writing in your notebook with an eco-friendly pen. Most of our notebooks include an equally beautiful, eco-friendly pen. This stunning bamboo notebook and pen set is one of our best sellers. To order this, click HERE. Eco notebooks are not only useful and beautiful – they are a sure fire way to support the green initiative. Show your clients you care about the earth, by ordering these lovely eco notebooks from Brand Innovation. A great marketing product! Today is Earth Day! A day to address our climate change issues, make a change and celebrate the earth. Here at Brand Innovation we are always trying to further our ‘green’ lifestyle. We have selected a few of our favourite eco-friendly promotional gifts, to help you choose an amazing and environmentally friendly corporate gift. This product is not only useful in the office, but it promotes the wonderful idea of recycling. Our Eco-Logical Tech Set is the perfect gift for anyone that uses a computer. Bamboo is the fastest growing and most sustainable wood on earth. A stunning set that infuses technology with the green initiative. The Solar Tree is a striking product. It is beautifully designed, it can charge almost any mobile device and best of all – it utilises the sun’s energy to produce clean, green energy! Eco-friendly promotional gifts are not only great for branding and marketing purposes – but it helps the earth too, and at Brand Innovation we believe the earth is ours to look after. So, keep going green and turn your Earth DAY into an Earth YEAR! 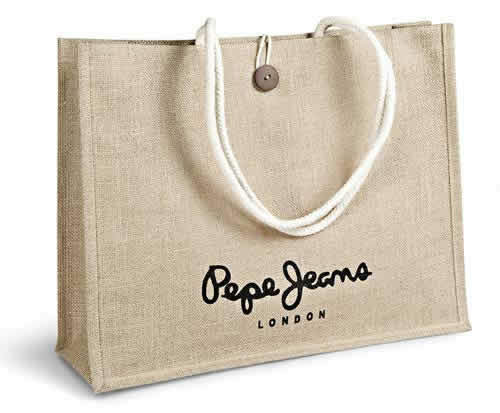 If the term ‘eco-friendly fashion’ appeals to you, then our Long-handled Eco Shopper Bag is just the thing you need! This bag makes for a clever, trendy and environmentally friendly corporate gift or marketing product. The big blank space serves as an excellent canvas to promote your company. Why wait? Order your Long-handled Eco Shopper Bag from Brand Innovation today, by contacting us and join the world of eco-friendly fashion! If you are in the food or hospitality industry and looking for a great, eco-friendly promotional item or give-away, then we have a stunning product for you. Our recycled newspaper pencil is perfect for hotels looking to give away branded stationery, while still conveying the message that they support the green initiative. The customers will love the funky design and think of the hotel with a smile every time the write. If you run a restaurant and you are looking for a fun and environmentally friendly way to replace old, outdated stationery – this is the answer. Recycled newspaper pencils makes for a fun alternative. Customers will be intrigued by the cool design, and you get your company’s name out there in an eco-friendly way! 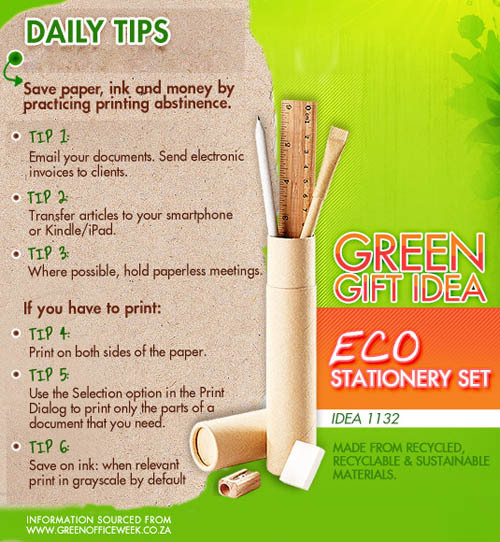 Do you want to use the recycled newspaper pencil as a corporate gift? Not to worry, our newspaper pencils are also available in a tube of 12. Have a look at those HERE. A funky, eco-friendly promotional product that is bound to create a talking point – about your company! ‘Going Green’ is term that is on everyone’s lips. It’s a lifestyle that has become an integral part of many households and businesses. We at Brand Innovation firmly believe in the concept of ‘Going Green’ and an eco-friendly lifestyle. This also reflects in the wonderful, eco-friendly products we offer. Do you have a product launch, company conference or a promotional event coming up? How about giving these great, eco-friendly gifts? These lovely notebooks are made from recycled materials. We offer a wide range of different, environmentally friendly pens and stationery. Our eco-friendly bags are both beautiful and durable. So what are you waiting for? Go green or go home! Recycling is one of the best ways to reduce your carbon-footprint. Why not start recycling at the office then? At Brand Innovation we like to lead an environmentally friendly lifestyle, and recycle. You can easily recycle the following materials at your office – like we do! Paper is always in abundance in an office – so instead of trashing it, RECYCLE! Recycle all your broken or old glasses and stationery. These pens are made from recycled paper and plastic and come in red, white and, of course, green. Our recycled paper cube holders only come in black and are made from recycled plastic hangers from department stores. By recycling materials, and giving gifts made from recycled materials, your recycling initiative can come full circle! Eco Friendly Promotional Products in South Africa. - Eco friendly promotional products are a great new way to market your business. Branding your company name and logo on an eco friendly product is a great way to show the world that you support environmental awareness and green living. 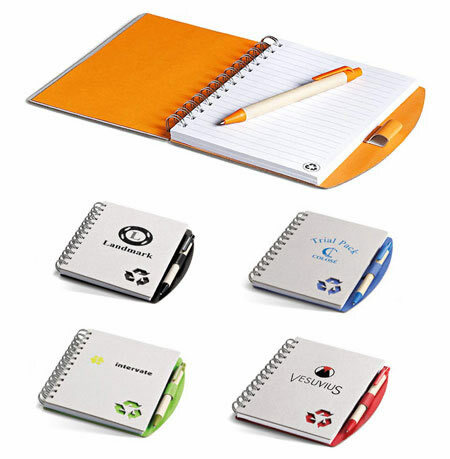 An eco friendly notebook or eco friendly pen is a popular and useful item to use as a promotional product. Eco Friendly Pens in South Africa. 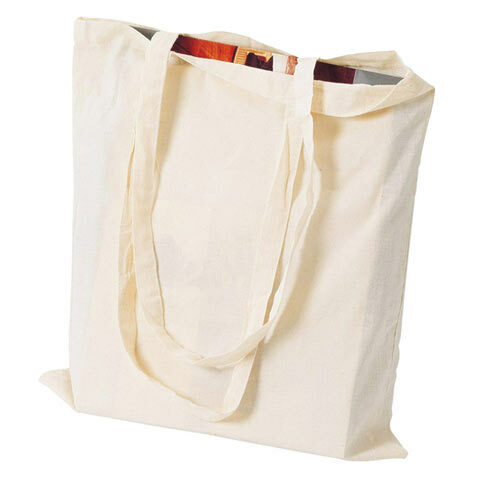 - We are once again showcasing the long handle cotton shopping bag, as this such a great eco promotional item. Shopping bags make great promotional gifts beacause everyone uses them. These cotton bags are great for printing with your company logo. Eco Friendly Pens in South Africa. - This is a fantastic eco friendly promotional pen. The barrel is made from recycled wood pulp and the clip & tip from polished chrome. The New Haven eco pen is stylish andenvironmentally friendly and is a great promotional item to show that your company cares about the environment. The pen comes with black German ink. The barrel of the pen can be branded with a print. We supply eco friendly pens throughout South Africa. To order your eco friendly pens please email us at info@brandinnovation.co.za. We look forward to assisting you with all your eco friendly gifts. Bamboo Pen suppliers in South Africa. - The Unity Bamboo Pen is a stunning eco friendly gift pen. This pen is made from renewable bamboo with chrome brass clip and trim. These eco friendly pens are presented in a beautiful bamboo pen box. The pen and box can be engraved with your company logo and is a great way to support eco friendly living. This eco friendly gift pen is sure to be appreciated by all who receive it. Eco Friendly Notebook and Pen in South Africa. 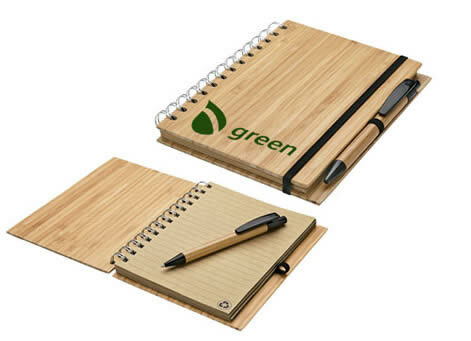 - Our eco friendly notebook and pen is a popular corporate gift for the environmentally conscious. 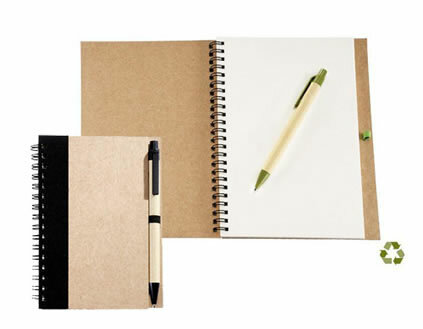 This spiral bound notebook has 70 recycled paper pages and the notebook cover and pen barrel is made of recycled cardboard. This eco notebook is available in A5 and A6 sizes. We do all the branding for you so that your logo looks fabulous on the notebook. To order your Eco Friendly Notebook and Pen please email us at info@brandinnovation.co.za. We deliver door to door to any address in South Africa. Supplier of eco friendly wood USB flash drives in South Africa. - Bamboo is the fastest growing sustainable wood on earth. 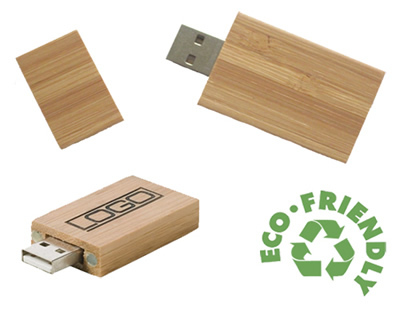 Our eco bamboo usb is a great way to show your support for going green. This wood USB can be branded with a printed or engraved logo and makes a stunning corporate gift. We have various size capacities available. To order your eco friendly USB flash drives please email us at info@brandinnovation.co.za. We deliver door to door to any address in South Africa. To order your long handle cotton shoppers please email us at info@brandinnovation.co.za. We deliver door to door to any address in South Africa. Eco Friendly Pens South Africa - An Eco Friendly Pen makes a great, cost-effective promotional product that shows your company cares about the environment. These great eco pens are made from recycled cartons and plastic. We brand these eco friendly pens with your company logo. To order your eco friendly pens please email us at info@brandinnovation.co.za. We deliver door to door to any address in South Africa. Eco friendly notebooks are very popular as corporate gifts and promotional products. We have a range of different eco notebook styles and sizes. The Bonaire eco notebook is one of our best sellers. This great eco notebook is spiral bound with a cover and paper made from 100 % recycled material. The Bonaire eco notebook also includes a matching eco friendly pen. To order your eco friendly notebooks please email us at info@brandinnovation.co.za. We deliver door to door to any address in South Africa. Our 4GB bamboo flash drive is a great eco friendly gift. USBs and flash drives are very popular and useful corporate gifts. These great wooden usb drives are made from bamboo, the most renewable and fastest growing plant on earth. We engrave your company logo on these great bamboo flash drives. Solar energy and solar power products are a great way power your electronics and gadgets. These promotional products are energy saving and use only solar energy. This shows that we can do more to go green and save the environment from the effects of climate change. 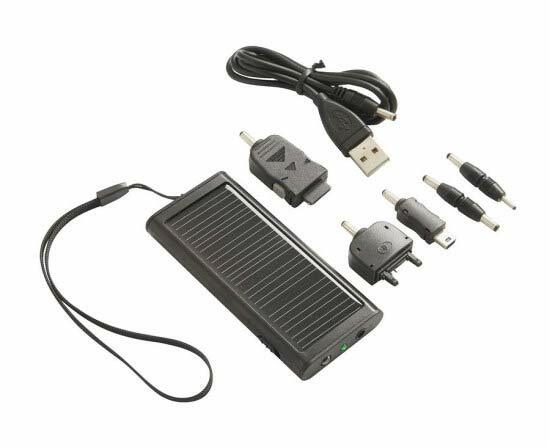 This great solar powered mobile charger comes with a USB cable and a selection of different fittings to be able to charge most phones. This charger uses a solar panel and can be used anywhere, allowing you to charge your phone wherever you go. The end of the year is fast approaching and it is Christmas shopping time! 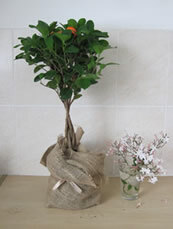 Why not help your clients and staff by going green and giving them some fantastic eco-friendly shopping bags. Our great Long Handle Eco-Friendly Shopping bag is a great, cost effective cotton shopping bag. These bags are renawable and reusable and will make a fantastic eco friendly promotional product. It is Spring and the theme for the month at Brand Innovation is Eco-Friendly products. This month we focus on all our green, eco and earth friendly products and raising environmental awareness and growth. We've even got a new little office plant to inspire us! We are surrently upgating our great eco-friendly gifts website and adding some new eco promotional products and corporate gifts and soon we'll even be supplying spekboom sprouts and seedlings. Join us this Spring and go green! The conservation of our planets resources is now a world-wide issue. Plastics are continuing to replace metal parts in a relentless search for sustainability and low cost in the point of sale industry. Converting metals to plastics also provides benefits to performance across many other sectors, including aerospace and automotive engineering where reduction in weight is key. Any product that a manufacturing company places on the market will have an impact on the environment. We take this seriously, so are therefore constantly researching new manufacturing techniques and materials in an effort to reduce our carbon footprint. Most conventional plastics are made from materials such as PVC or polypropylene, which although is recyclable, will not biodegrade over time. Therefore these types of plastics have long term implications to the environment, with the potential to reside in the ground for a very long period of time. Although additives can be added to the plastics to help speed up this process, there is still no environmental certification for this. Degradable or Bio degradable plastics are typically produced in two forms, injection moulded plastics, and films such as organic fruit wrappings. These plastics will degrade or biodegrade over time, although they do require a specific environment of moisture and oxygen which can be found at most professionally managed composting facilities. Bio Compostable plastics have components that are derived from renewable raw materials. These are typically natural plant or corn based and fully compostable. Turning from plastic into carbon dioxide, water and biomass. These products are classed as renewable carbon. Over 200 million tons of plastic is manufactured annually around the world. Of this only 26 million tons of plastic waste is recycled.